The 2018-19 Flying J’s Gymnastics team. Pictured back row (left to right): Assistant Coach Abigail Grillot, Jocelyn Mumaw, Erin Leensvaart, Katelynn Cleere, Jayla Pothast, Arianne Garrison, Coach Jessica Pothast. Middle row (left to right): Addysen Mills, Jillian Mumaw, Vivian Dapore, Josephine Pothast, Lauren Prenger, Shawna Schmitmeyer, Emma Bomholt, Evelyn Miller, Carley Holzapfel. Front row (left to right): Piper Burgett, Alexus Jordan, Kiersten Dickey, Mylie Austerman, Chloe Steinbrunner, Ava May, Ella Livingston. 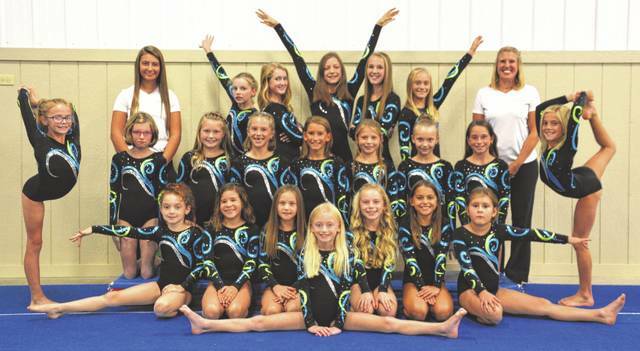 Flying J’s gymnastics had its opening meet in October at Dayton Academy in Huber Heights. The girls enjoyed the Hallowbeam invitational with Level 3, 4, 5 and Platinum competing in this completion. It was a good opening meet. Level 3’s placed first with Alexus Jordan from Wapakoneta leading the group. She had a terrific first meet placing first all-around and first on Vault, Bars and Floor. Jocelyn Mumaw, Versailles, was another big contributor with a 8.4 on bars placing first and fourth on Beam. Shawna Schmitmeyer, Versailles, also had two scores to help with the team score, placing her third on Beam and fourth on Vault. Other scores helping with the team score includes Emma Bomholt of Versailles with her Bar score and Floor score, which she placed third. Carley Holzapfel , Versailles, Ella Livingston of Union City and Addysen Mills of Bradford helped additional team scores. Mylie Austerman and Piper Burgett, of Bradford, Vivian Dapore, Ansonia, and Ava May, Versailles, also competed at their first meet ever. For the Level 4s, they placed second as a team. Katelynn Cleere, of Greenville, scored second all-around and placed on Vault, Bars and Floor. Erin Leensvaart, also from Greenville, had a great day placing on Vault, Bars and Beam. Evelyn Miller, Versailles, placed on Vault and Bars and helped the team score. Lauren Prenger of Versailles placed third on Floor and helped with the team score as well as Kiersten Dickey of Versailles. As a level 5, Chloe Steinbrunner, Versailles, had a great first meet with high Vault and Beam Scores. Josie Pothast, Versailles, as a Excel Platinum, had a good opening meet as well placing fourth all-around. The second meet of the season was home at the Flying J’s Gymnastics in Versailles. The girls had a fun meet with competition coming from as far as Toledo, and as South as Kentucky. The Level 3’s placed third and had many gymnasts helping with the team score including Alexus Jordan, Addysen Mills, Ella Livingston, Carley Holzapfel, Emma Bomholt, Jocelyn Mumaw and Shawna Schmitmeyer. Mylie Austerman, Piper Burgett, Vivian Dapore, Ava May, and Jillian Mumaw of Versailles also competed that day. The Level 4’s placed second at their home meet with Katelynn Cleere having a wonderful day placing on all events, first on Vault, Bars and All-Around. Erin Leensvaart placed first on Beam and helping the team with three scores as well as Evelyn Miller. Lauren Prenger also helped the team score. Kiersten Dickey competed as well. Chloe Steinbrunner competed as a Level 5 and had improvement on Vault and Floor. For Excel Platinums, Josie Pothast got a 9 on floor and Arianne Garrison placed second on Bars and third on Vault, Beam and All-Around. For the third meet of 2018, Flying J’s Gymnastics team traveled to Twigs in Miamisburg. The Level 3’s had a good meet with Jocelyn Mumaw placing first on Vault, Bars and All-Around. Alexus Jordan had first place on Vault and helped the team with a score on beam placing fourth. Ava May also had a good day with three scores being used and placing fourth on Vault. Shawna Schmitmeyer helped the team with her Beam and Floor score. Other team scores used came from Emma Bomholt, Carely Holzapfel. Mylie Austerman, Piper Burgett, Vivian Dapore, Ella Livingston and Jillian Mumaw also competed in this meet. The Level 3 team placed fourth. As for the Level 4’s, Katelynn Cleere placed second on All-Around, Bars and Floor, using three scores. Lauren Prenger had a great day with second on Vault and three scores being used for the team. Erin Leensvaart placed first on Beam and second on Vault and two scores were used for the team. Kiersten Dickey and Evelyn Miller both had two scores to help the team score. The Level 4’s placed fourth. Chloe Steinbrunner had a much improved meet as a Level 5, improving on beam and Floor and placing first on Beam and second All-Around. For Excel Platinum, Arianne Garrison placed first on beam with 9.2 and seventh All-Around. Josie Pothast also competed.